Preheat oven to 400 degrees. 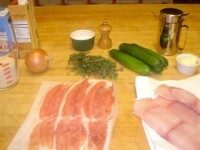 To prepare the fish, lay two slices of prosciutto side by side on a flat surface. Put one piece of halibut crosswise on the prosciutto; sprinkle lightly with salt and pepper; and one-quarter of the thyme. Wrap the prosciutto around the fish. Do the same with the remaining fish. To cook the fish, put the olive oil in a frying pan over medium high heat. In it lightly brown the prosciutto-wrapped fish on both sides. Slide the pan into the preheated oven and cook another 5 minutes, until the fish is opaque. Remove the fish to a warm plate. In the pan, cook the shallots for a minute or two, stirring. Pour in the wine and boil up. Swirl in the butter. Add salt and pepper to taste. Pour these juices over the fish and serve. To make the rice, in a saucepan cook the onion in the butter with half a teaspoon of salt until the onions are soft. Stir in the rice and coat with the onion mixture. Pour in the chicken stock; bring to a boil; cover; and turn down the heat to the barest minimum. The rice is done when the liquid is absorbed by the rice, about 25 minutes. It is best not to stir it but just leave it covered until ready to serve. 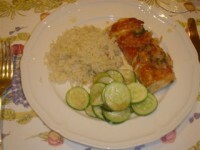 To prepare the zucchini, thinly slice the zucchini and put it in a saute pan with the butter and water. Cover and let the zucchini steam until tender when pierced with a fork, about 2 minutes. Sprinkle the cheese over the zucchini, cover, and turn off the heat.